Ride Photos can be found here. (April 7, 2018 Spokane, WA) – The rain was coming down in sheets. In that special way that rain falls in spring – torrential, driving. 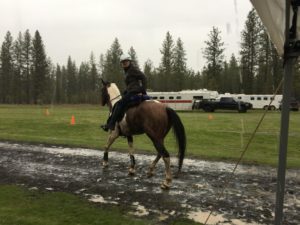 And that was how it was on Saturday morning as a hardy group of distance riders set out on the well-marked course for the start of the Equine Distance Riding Association (EDRA) season. And among the group of happy riders was one small girl. Nine-year-old Miss Georgia on her trusty horse Gracie. 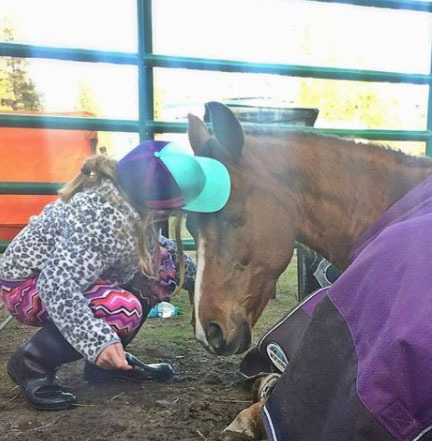 It would be her first 25 mile ride and Erin Putnam had stepped up to sponsor the youngster. Georgia and her American Blazer, Gracie. Photo by Brian Dirks. “The trails at Riverside State Park are special to me. 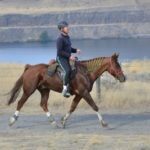 After over a year of disappointments and frustrations with horses that weren’t the right fit for endurance, Oreo and I completed our first 25 mile ride at April Daze in 2015. At Crazy Days in September of 2016, Terry James and Bucky escorted us through our first 50. At the April 7, 2018, Crazy Daze, Oreo and I had the privilege of escorting nine-year-old Georgia Glidden and her horse Gracie through their first 25. When Georgia’s mentor, Jennifer Kaplan, mentioned at the EDRA Convention that a 9YO girl had joined without her parents, I was intrigued. When Jennifer later posted that she was looking for someone to sponsor the girl at April Daze, I thought, “Why not?” I and Margie Woodford and Shannon Peckham were already planning to do a turtle pace 25, so let’s check this out,” wrote Erin. It’s worth noting that Georgia’s mount, Gracie, is an American Blazer. A breed of horse whose breed association mandates a gentle disposition. To learn more, visit the breed association here. The trails were well marked despite attempted trail sabotage on Friday and the rains on Saturday. Riders were able to follow the route with the GAIA app but most found they didn’t need it with ample amounts of chalk and ribbon showing the way. One person grateful for the well-marked trails was Lynn Atcheson who took first in the fifty mile and Best In Class. A wet Lynn and Banner head out for another loop relaxed in a halter. Photo by Heidi Taggart Larson. In her own words, “I’m notorious for always getting lost,” Lynn laughed. 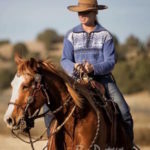 So with the first few loops she tracked behind Sue and Dennis Summer before swinging to the front with her horse knowing the way. She finished in a time of 5:05 on a fit and happy Banner. Banner is a gelding of unknown age and origin, although best guess puts him about 16 and perhaps an Arab cross. This was his first victory in a 50 miler although he gave indication of his talent two years ago when he took first in the 30 mile Prineville Ride. He’s consistently Top Ten but it wasn’t until Lynn’s friend Jamie Hughes encouraged her to step up to a fifty that the pair really started to shine. A relaxed Banner at Vet Check. Photo by Heidi Taggart Larson. 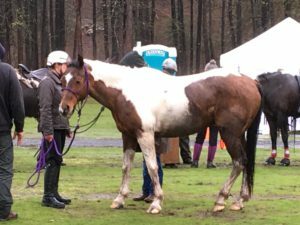 But finish they did, and after a mild winter in the Gorge area of Washington and solid conditioning on the hills surrounding the Columbia River they were ready for April Daze. Lynn attributed the 3,500’+ elevation changes in her conditioning rides as a big part of Banner’s fitness. Want to join Lynn at Grizzly? Be sure to check out the ride page here. Grizzly Mountain is Saturday, April 21, 2018.